It gives me immense pleasure to share my classroom experience with you. It all started with a conversation at the office of Dr. Jayashree Ramadas regarding the Small Science curriculum. I take this opportunity to thank her for encouraging me to try this in my classroom. I’ve raised funds to provide books (text book and work book) to every child (65) in my classroom – Grade 4th. They just loved so much that for first few weeks throughout the school these books were in their hands – irrespective of whatever is taught. The pictures, experiments and activities just touched them. Further, during execution throughout the year, the kids never felt that it was a “subject”, they in fact loved doing these activities and experiments at home. The curriculum in fact empowered them to feel that every observation/curiosity has an answer and it is perfectly fine to have questions and ask them. istakes to learn from it. 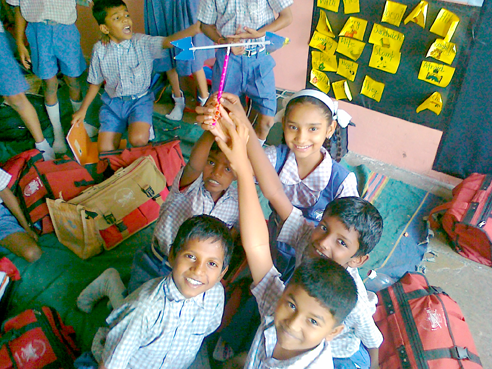 This year witnessed remarkable growth in EVERY SINGLE CHILD, in many aspects – including confidence, experimentation capabilities, observational skills, scientific temper, self reliance and co-operation, team building, sharing, criticizing, and a few kids have even shown signs of hypothesizing. Again, the young demonstrators, all confident and ready. As the Grade 4 books have mostly written observations and explanations – a few kids had difficulties in doing that. Initially kids who were not very much in the habit of maintaining daily records missed out on observations and interpretations in the first unit. Many from conservative mindsets did not support their kids to do experiments at home, but they were happy when kids voluntarily asked them questions and interacted with them. As a result a few kids heavily relied on experiments and observations done in the classroom and those done by their friends. Though the way in which Small Science is done, is very nice, much in sync with the CCE (Continuous and Comprehensive Evaluation) pattern, yet the school insisted on having exams. Hence I conducted exams which were more of skills/understanding – based on the lines of the ASSET papers, and kids performed wonderfully. Above all, my year long experience was very satisfying, I can say NOW ALL KIDS love coming to school, and there has been dramatic change in their personalities: a perfect time to end my fellowship.